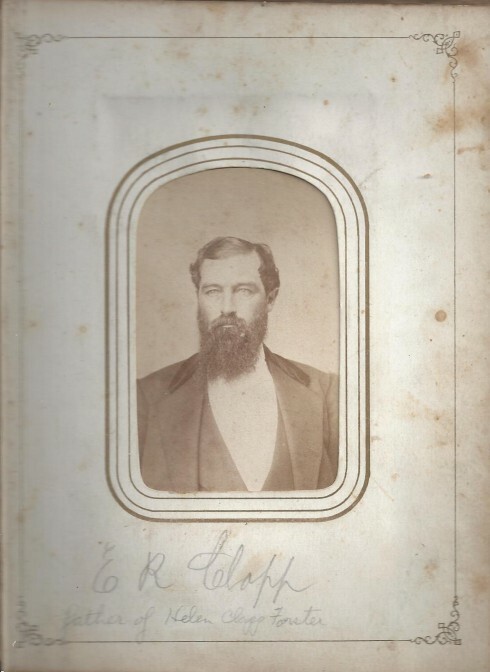 E.R., as he was known, was a powerful and well connected man in Des Moines. He was a banker, real estate developer and a factory owner. He was “Sargent of Arms” of the Iowa State Legislature and moved in the highest levels of Iowa politics and society. But of course all that didn’t happen at once. We know from other sources that Edwin, or Ed. R, or E.R., came to Fort Des Moines as a young man and found work on the river as a ferryman. But we have not had a lot of details. If you speak nicely to google, she reveals some references to E.R. Clapp’s early life. four cross-cut saws operated by four men by hand. We know from other sources that E.R. 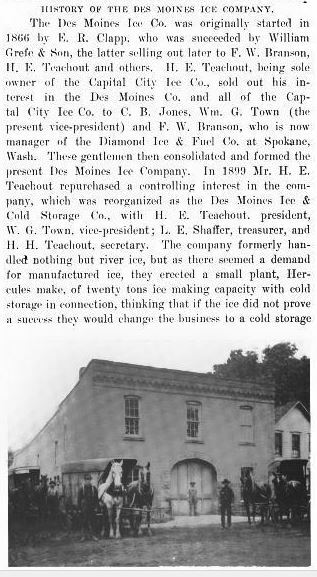 started and owned The Des Moines Ice Company, cutting and storing ice from the river. Later he would install the first industrial refrigerated ice making machine in Des Moines. Would it be possible for the blog author to contact me off-line? I am interested in including the image of E.R. Clapp in a museum exhibit and would like to ask for permission to make use of this image. Please email jdennis@lhf.org. Thank you! I do not know if you monitor this blog, or if you have replied to living history farms. E.R. Clapp previously owned the property that is today living history farms. That is where he raised beef cattle during the Civil War. Ella Clapp White is my Great-Great Grandmother. Her son W.L. White, Jr. married Elizabeth (d. 1921 Woodland Cemetery Des Moines – I don’t know her maiden name) and they had three daughters. The youngest daughter Margaret Jane White b. 1904 (my Grandmother) married Edwin Larkin Wight of Stuart Iowa, they had one child (my father) Edwin Ruthven Wight. My Grandmother’s sisters were Ella Ruthven White, who never married (b. 1900 d. 1958 Twin Bridges Cemetery Montana, used the name “Ruthven White”) and Helen Elizabeth White b. 1902, who married John Kirble (spelling?) and had children John Jr. and Joan. I believe they lived in California. W.L. White Jr. d.1944 Twin Bridges Cemetery Montana. I believe that you are mistaken about E.R. Clapp being in the shoe business. It was the W.L. White Shoe Co. located in the Clapp block, and as far as I know E.R. Clapp was the Landlord only. You also list him in your article about the Clapp family as William H. White, which is an error. Thanks for the correction on William L. White’s middle initial. You are correct of course. John Lewis and Lucy Clapp home is down the road from Living History Farms It still stands It started out as a two room home and was added on thru the years.